If you have never played or run a Murder Mystery Game before, ours are great fun. If you have, ours are still great fun! They do not come in “Boxed” form. You simply buy and download them from the Internet, then print them out. Each game has all the information and instructions you need to run your own murder mystery party. The games are designed so that everyone has a character to play. Each game has invitations for you to print out, fill in and give/send to people. These say which character you’d like them to come as. Ideally, people will receive them around a week before the party so they can look forward to it and sort out any props or costumes they might want. But, if you prefer, you can assign the characters and give out the invites on the night. A Selection Chart tells you which characters you should use, depending on how many guests you have. Some characters are male, some female, some have unisex names (Chris Watts, Sam Sharpe, etc.) and can be played by men or women. Every game has a Checklist and a Step-by-Step Guide. Using these will ensure you have everything ready in time and haven’t left anything out. We recommend you follow these instructions very carefully. Sometimes, the reason for doing something won’t become apparent until you are half way through a game. By then, it may be too late to do something which could easily have been done beforehand. How long does it take to put a game together? That depends on various things. Which game you buy, how many people it’s for, how quickly you work, how much trouble you go to over checking everything and getting everything ready. We reckon you should allow yourself at least several hours for this and never, ever leave it till the last minute. Make sure everything is in place well in advance of the event. Should you ask people to get dressed up? Your choice, depending on what you think will work best for your group. 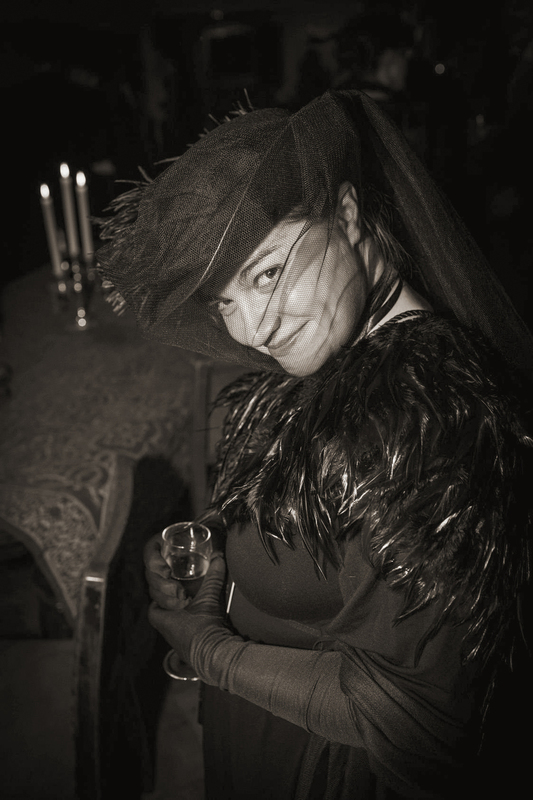 All our plots provide plenty of scope for fancy dress and some are set in particular eras (Victorian, Twenties, etc.) which lend themselves well to getting dressed up. It adds to the fun if people are in costume but is by no means essential. You don’t have to look the part to play it. For more on costumes, please go to our Murder Mystery Costume Guide. Several games have some “props” in them which, in the printed version, are represented by paper images. A crown, a cross, a sword, etc. If you have the time and inclination, you can sometimes replace these with physical objects which represent them instead. The items in your game will all be listed on the checklist. All of our games can be run over a meal. They can also be run on their own. If you’re having food and want seventeen courses and silver service, that’s fine. Your game will still work and still be fun. But KISS (Keep It Simple) is usually best. People helping themselves from a buffet, perhaps. Timings which aren’t set in stone. A lot of the meal prepared in advance so you don’t have any last-minute culinary mountains to climb. Some games provide Running Orders/Timetables for your meal. These are only meant as guidelines. Don’t let them restrict you. Feel free to adjust them as you go along, according to what you think is right. Different groups need different amounts of time. Because some of the games have “period” settings, you can enhance the theme of your party by serving food and drink to match. Coronation chicken, stews, meat pies and fruit punches for the Victorian Last Gasp. Fancy canapés, salads, anything edible from Downton Abbey and cocktails galore for the Twenties Final Curtain. School dinners, pop and ginger beer (plus no doubt some illicit booze) for St. Cakes. And let’s not forget the most important murder mystery drink of all: water. People talk a lot during our games. Every character is on a mission of some kind and can only achieve it by talking to the other characters. People talk a lot. And, often, they talk fast. So please make sure everyone always has access to plenty of water. Nearly all our games benefit from having plenty of space where people can move around and have private conversations with each other. Public announcements happen at various intervals for everyone to hear but people will get together and talk in small groups, too. Please bear this in mind when you are setting up for your party. Space is good. Keeping guests mobile is good. Where people sit is up to you (and/or them!). We want them to circulate and talk to lots of other people, even when it’s happening over a meal. You may arrange for characters who are a couple in the story to sit together. You may arrange for“grand” people not to have to sit next to humbler folk. These are understandable social rules but not absolutely essential – and interesting things can happen when they are broken! If you are having a seating plan, think of it this way: whatever might work best for your group in real life should also work best in your chosen game. Keep the music in the background, at a low-ish volume. Make sure people can easily hear each other, without having to raise their voices. Make sure that, if someone needs to address everyone, the music can be easily and speedily turned off. Of course, every game is different according to who plays it. We’d love to hear back from you about your experience of organising and running any of our games. Contact us at mmgames[add@ here]mayhem.org.uk or on Facebook.